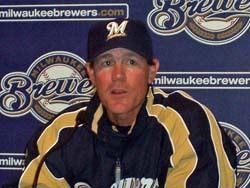 Milwaukee Brewers manager Ned Yost (pictured) is going to give struggling left handed pitcher Chris Capuano one more chance. Capuano has lost 10 straight and the Brewers are 0-15 in his last 15-starts. Capuano&apos;s earned run average over that stretch is 6.66. He&apos;s 5-10 overall with a 5.23 ERA. Ned Yost said if Capuano gets himself back on track, he&apos;ll be a huge bonus for the Brewers. Capuano&apos;s next start is Sunday against the Cincinnati Reds at Miller Park.